In the forensic context it is quite common for nonhuman bones to be confused with human remains and end up in the medical examiner or coroner system. It is also quite common for skeletal remains (both human and nonhuman) to be discovered in archaeological contexts. While the difference between human and nonhuman bones is often very striking, it can also be quite subtle. Fragmentation only compounds the problem. The ability to differentiate between human and nonhuman bones is dependent on the training of the analyst and the available reference and/or comparative material. 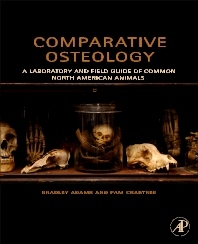 Comparative Osteology is a photographic atlas of common North American animal bones designed for use as a laboratory and field guide by the forensic scientist or archaeologist. The intent of the guide is not to be inclusive of all animals, but rather to present some of the most common species which also have the highest likelihood of being potentially confused with human remains. Dr. Adams’ expertise is in the field of Forensic Anthropology. He is currently the Director of the Forensic Anthropology Unit for the Office of Chief Medical Examiner in New York City. Dr. Adams and his team are responsible for all forensic anthropology casework in the five boroughs of New York City (Manhattan, Brooklyn, Queens, the Bronx, and Staten Island). Dr. Adams and his team are also integral players in the ongoing recovery and identification work related to the September 11, 2001 attacks of the World Trade Center. Prior to accepting the position in New York, Dr. Adams was a Forensic Anthropologist and Laboratory Manager at the Central Identification Laboratory (CIL) in Hawaii from 1997-2004. The CIL is responsible for recovering missing U.S. military personnel from remote locations across the globe and its staff utilizes forensic anthropology as a key component in the identification efforts. While with the CIL, Dr. Adams directed large-scale recovery operations in such locations as Vietnam, Cambodia, North Korea, and Papua New Guinea. Dr. Adams has served as an expert witness in Forensic Anthropology in multiple court cases, he has worked as the project osteologist on several archaeological excavations, he has authored/edited several books, and he has published numerous articles in peer-reviewed journals on topics relating primarily to forensic anthropology. He is a Diplomate of the American Board of Forensic Anthropology, a Fellow with the American Academy of Forensic Sciences, a founding board member of the Scientific Working Group for Forensic Anthropology, and a member of the Editorial Board of the Journal of Forensic Sciences. Pam Crabtree is an associate professor of anthropology in the anthropology department at New York University. She joined the NYU faculty in 1990. Crabtree’s primary research interest focuses on the zooarchaeology of early medieval Europe. The results of her research have been published in the Journal of Field Archaeology, World Archaeology, and her 1990 book, West Stow: Early Saxon Animal Husbandry. Her forthcoming book, Middle Saxon Animal Husbandry, is based on her analyses of the zooarchaeological collections from the Anglo-Saxon sites of West Stow, Brandon, Ispwich and Wicken Bonhunt in eastern England. Dr. Crabtree has also analyzed faunal collections for many other parts of the world. She worked on the animal bones recovered from the Five Points Site, a 19th-century multi-ethnic neighbourhood in New York City; Dún Ailinne, an Iron Age royal site in Ireland; Tepe Godin, a Chalcolithic, Bronze Age, and Iron Age site in Iran; Salibiya I, a Late Natufian site in the West Bank; and Kelheim, a late Iron Age oppidum in Southern Germany. She is currently the staff zooarchaeologist for the Amheida project in Egypt and the Razdolnoe project in Ukraine. Dr. Crabtree has written and edited a number of books on archaeology and zooarchaeology including Exploring Prehistory: How Archaeology Reveals our Past (with D. V. Campana), Medieval Archaeology: An Excyclopedia, and Ancient Europe: An Encyclopedia of the Barbarian World (8000 BC - AD 1000) (with P. Bogucki). She recently co-edited Anthropological Approaches to Zooarchaeology: Colonialism, Complexity and Animal Transformations (2010). Dr. Crabtree is the Treasurer and a member of the Executive Committee and the International Committee of the International Council for Archaeozoology. Her research has been supported by the National Science Foundation and the National Endowment for the Humanities.